Executing a most scenic exit strategy. 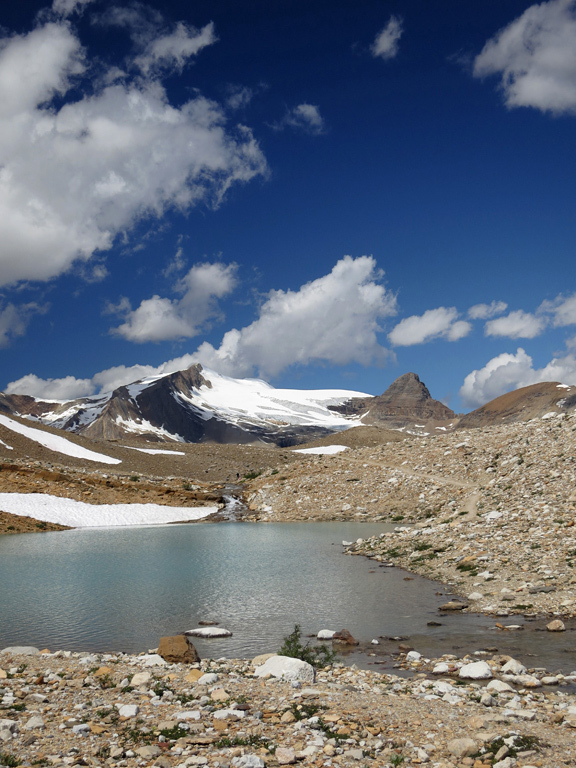 Above: Once in the high alpine, hikers are granted fabulous views of high alpine tarns, glaciers, and dozens of peaks. A lot of elevation gain for a “tourist hike”. Note that the travel time and distance shown is for a one direction return from the Stanley Mitchell Hut and not a loop. 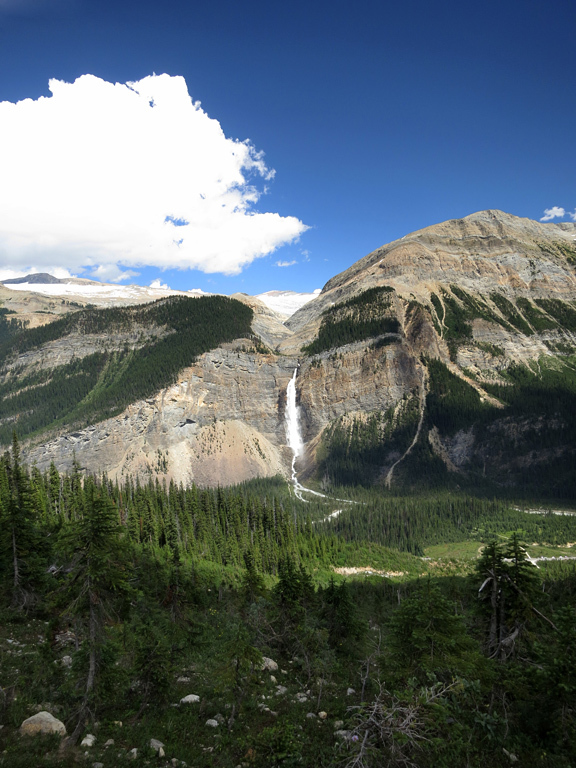 Considered as one of the best (tourist) hikes in the Rockies, the Iceline Trail in Yoho National Park begins at one of the largest waterfalls in Canada and then winds its way through a glacial moraine with numerous lakes. Aside from the impressive President Range looming above with its many glaciers, hikers along this route will also get treated to commanding views of both the Yoho and Little Yoho Valleys, and the dozens of impressive peaks beyond (six of which we climbed during the previous two days, and which are also documented on this site). 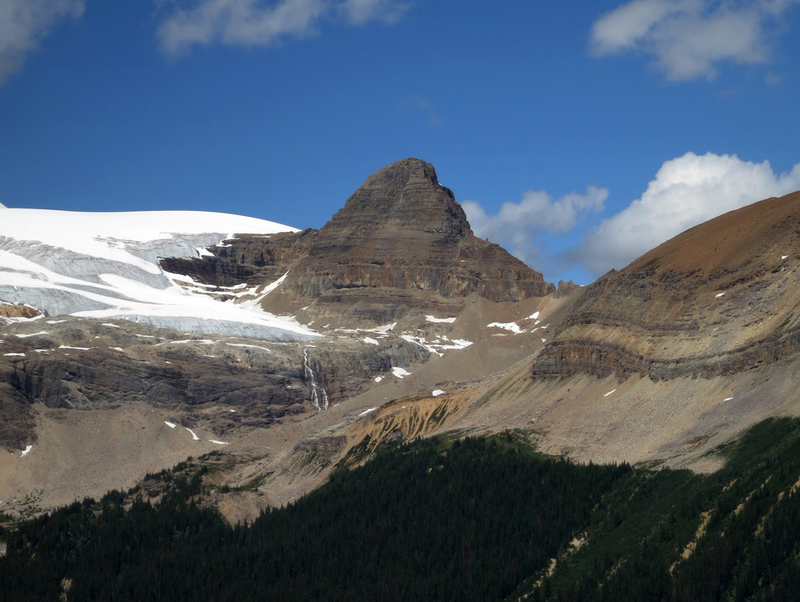 Done as a day-trip, most visitors hike 6-7km along the trail to a pair of lakes and the trail's highpoint (an observation point above where the two valleys intersect) before turning back, or will combine a portion of the trail with a visit to Celeste Lake; possibly completing a loop via Laughing Falls. 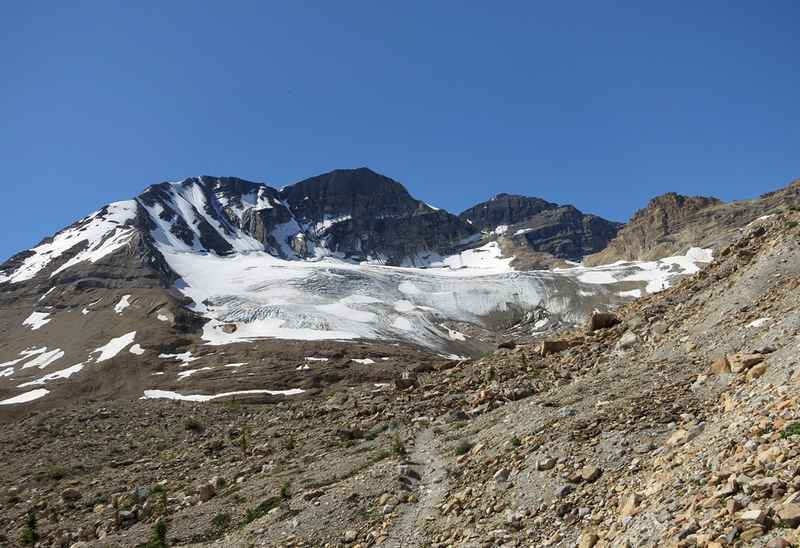 However, as this was the third and final day of an extended backpacking/scrambling trip for Steven and I, the Iceline Trail was simply our return route from the Little Yoho Campground (which is adjacent to the Stanley Mitchell Hut). This trip report details our return, but should still be useful to those planning different routes through the area. 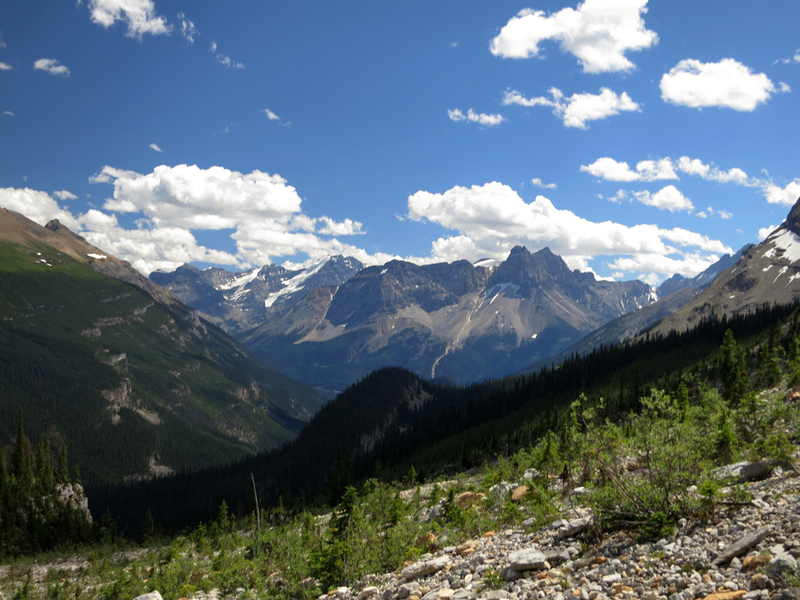 The regular trailhead for the Iceline Trail can be found next to the Whiskey Jack Hostel, which can be reached by following the Yoho Valley Road up from the Trans-Canada Highway (Hwy 1). 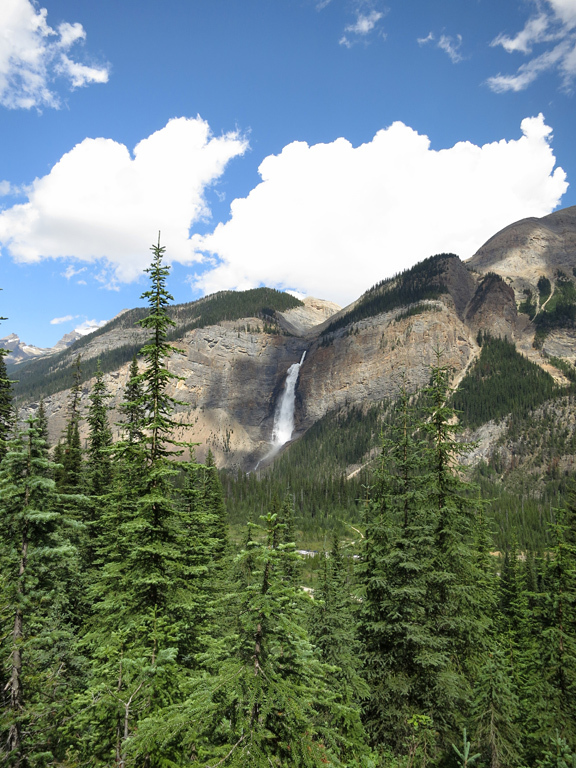 Two items to note: 1) You will need a valid park pass to access the area, and; 2) if you're not staying at the hostel, you are expected to park another 0.5km up the road at the Takakkaw Falls parking area. As our day started from the exact opposite end of the Iceline Trail, the described sequence of events and landmarks here will seem backwards to those starting from the hostel. The Iceline Trail starts at a junction south of a bridge crossing near the Stanley Mitchell Hut. 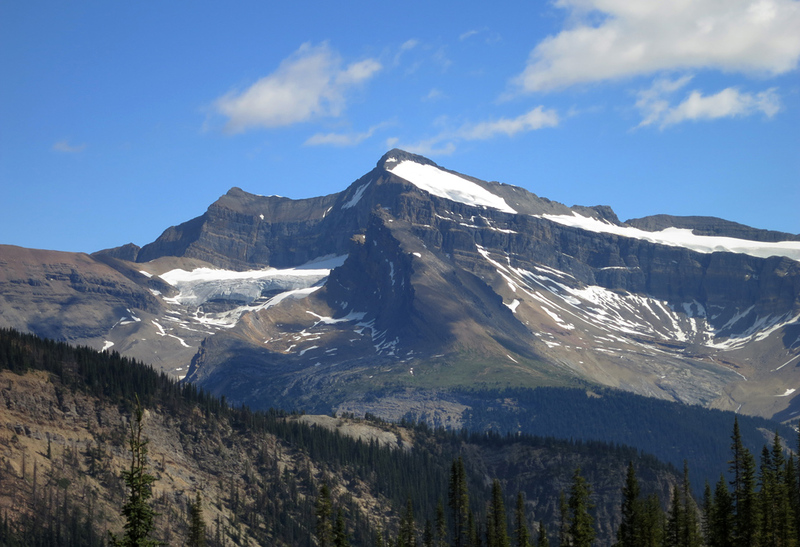 The trail climbs gently through the forest on a well-defined pathway as you gradually gain elevation below the glaciated north face of the Vice-President. Although we started reasonably early in the morning, it was already clear that it was going to be a very hot day; with our heavy packs and the wounds and soreness which comes from covering over 40km of terrain and nearly 4km of elevation gain in the two previous days, we were already suffering for it. We soon emerged from the woods out onto the open, rocky moraine. 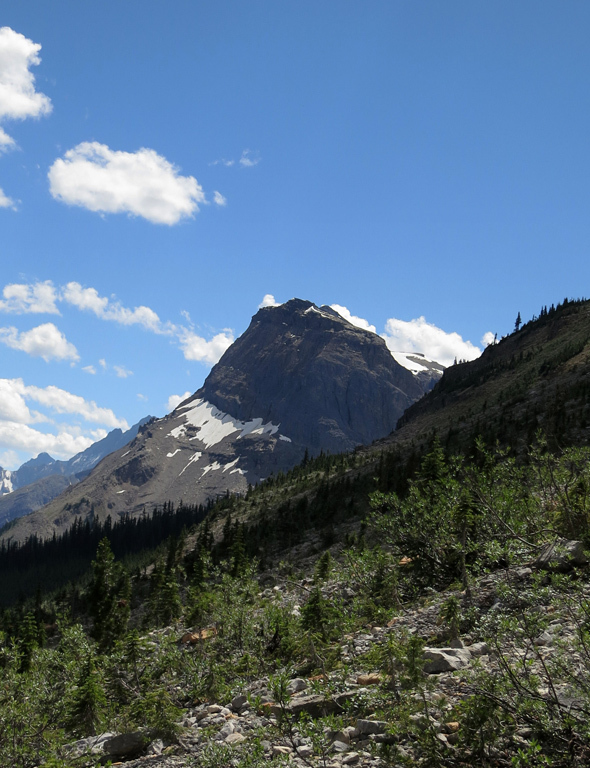 On a hot, sunny day, all the exposed rock in the moraine radiates heat, ensuring that anyone passing through will get thoroughly baked (in the non-herbal sense). 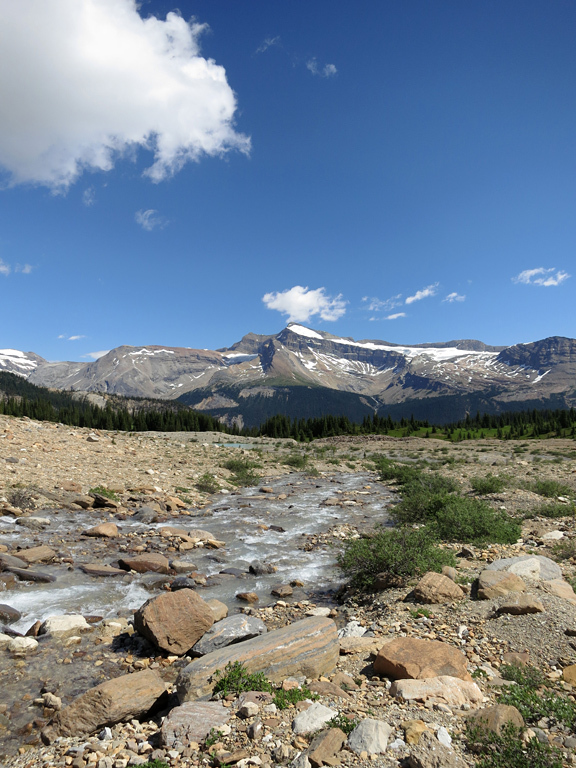 By the time we passed the first few tarns, a couple of snow patches, and then on to the trail's highpoint (which requires a quick side-trip up a cairned debris mound), the whole place was swelteringly hot. Good thing we only had 7km left to go! 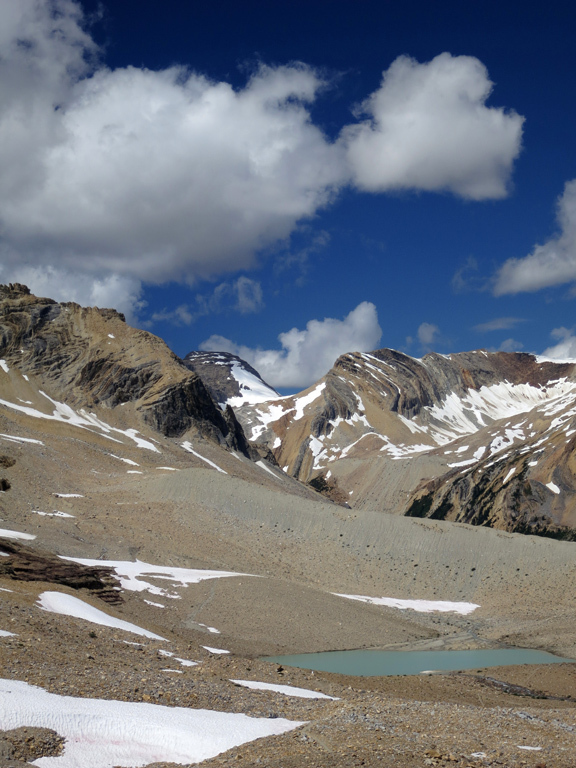 Soon after descending from the highpoint, we came over a ridge to discover a glacial lake. I had some people asking me “where the lake is”, or how they could get there, which was puzzling since the trail to this lake was obvious, and the lake was even in view, directly behind me, for one of the individuals asking. 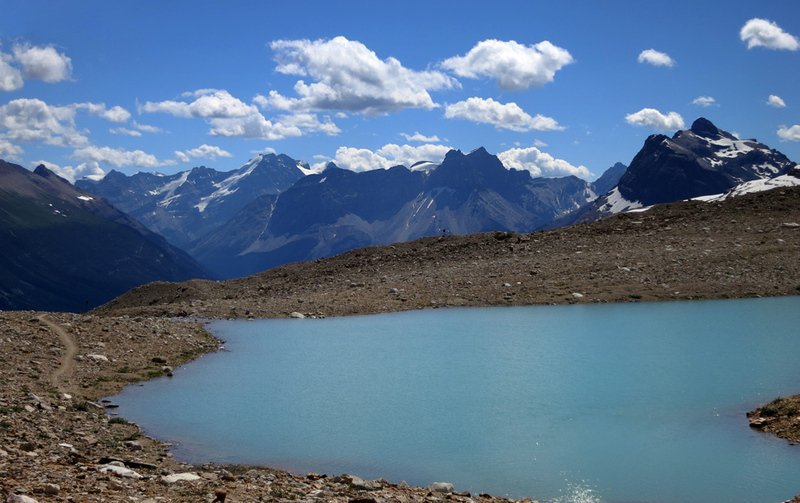 However, in retrospect, they may have meant Celeste Lake (protip: at least know the name of your destination if you're likely to need assistance from strangers). 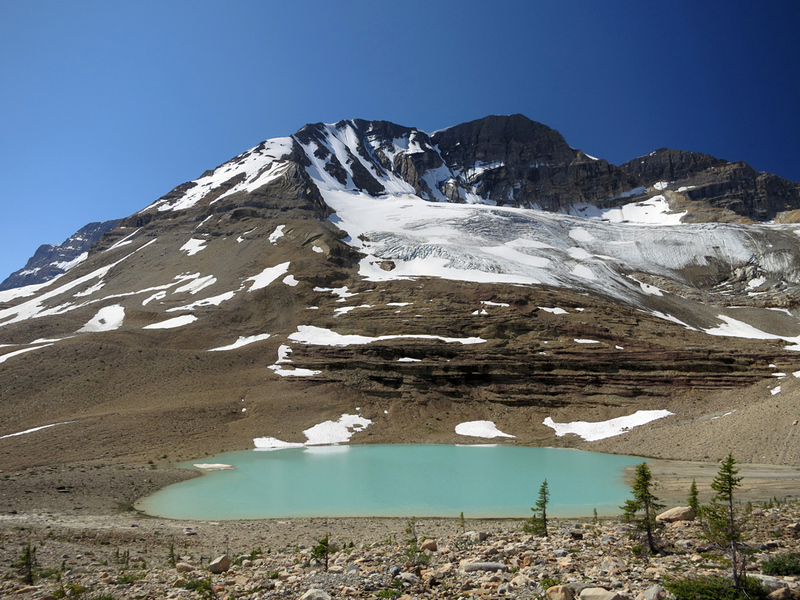 The answer to their questions (perhaps) is that Celeste Lake can be reached by turning east (downhill) from a signed junction at this glacial lake, onto the Celeste Lake Trail. 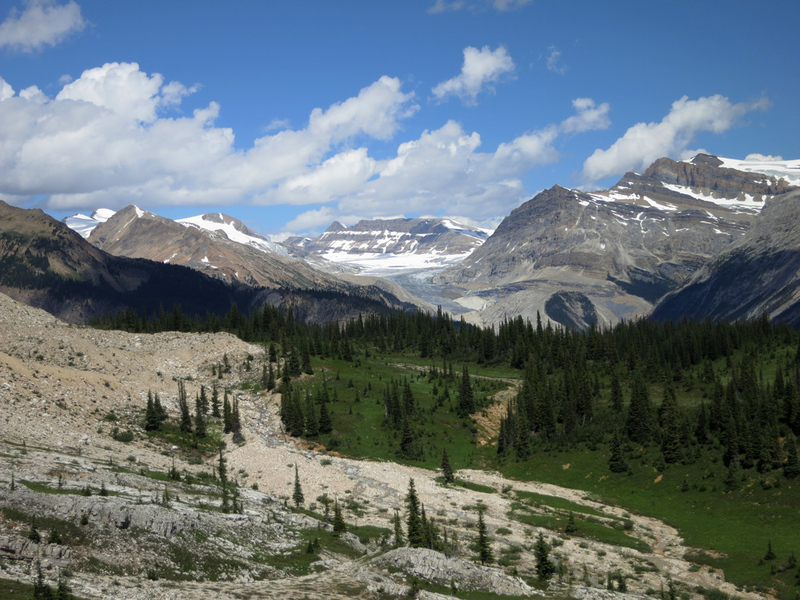 I never saw Celeste Lake from the Iceline Trail, so I can't comment on whether it's a worthwhile side-trip, but at the very least, the meadows in its general vicinity look quite lovely. 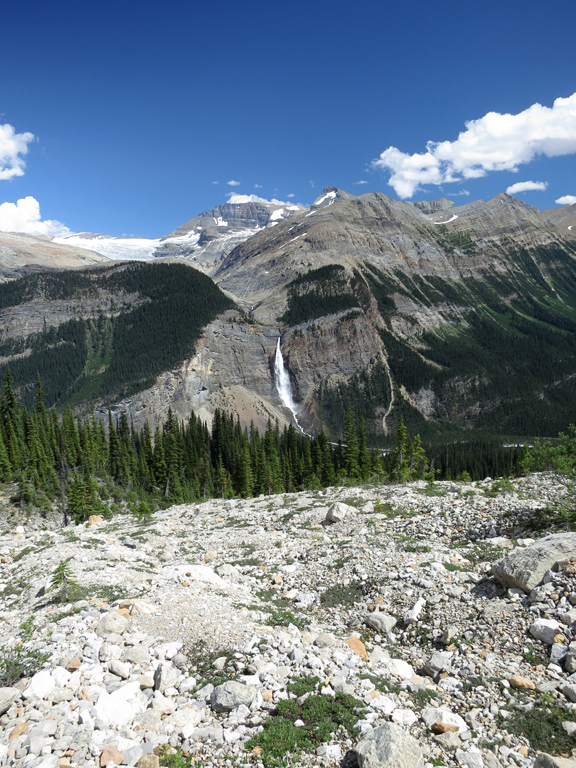 The next 3km of the trail snakes its way back and forth across the moraine and involves a number of small stream crossings that require some easy rock-hopping to traverse. 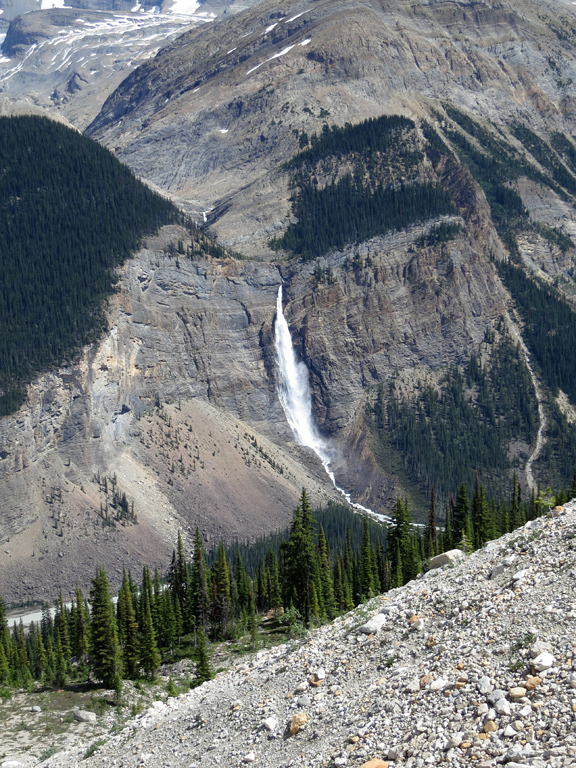 Midway through this area, Takakkaw Falls, and its impressive 255m (836ft.) 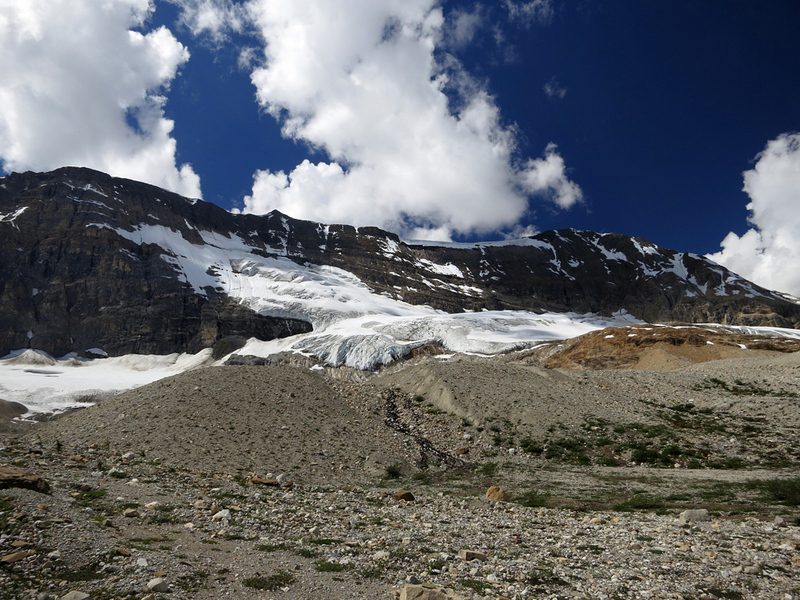 cascade of meltwater from the Daly Glacier above should come into view. The sightlines towards the falls continually improve as you travel southward until the trail begins its plunge towards the valley below and some sorely missed shade. You'll pass a few trail junctions on the way down, but they are very well signed, so there's no real need to describe that section. 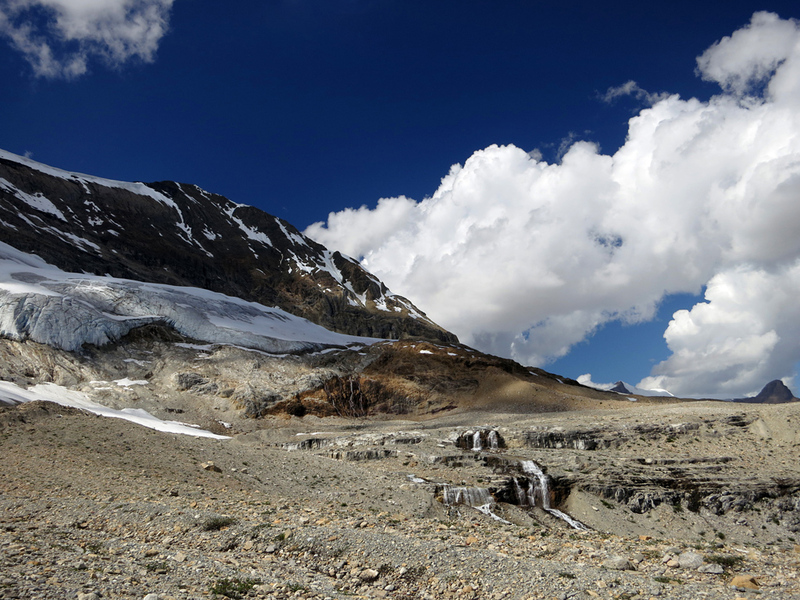 The last few kilometres should go by quickly as you descend nearly 600m, back to the trailhead near the foot of Takakkaw Falls. Mt. 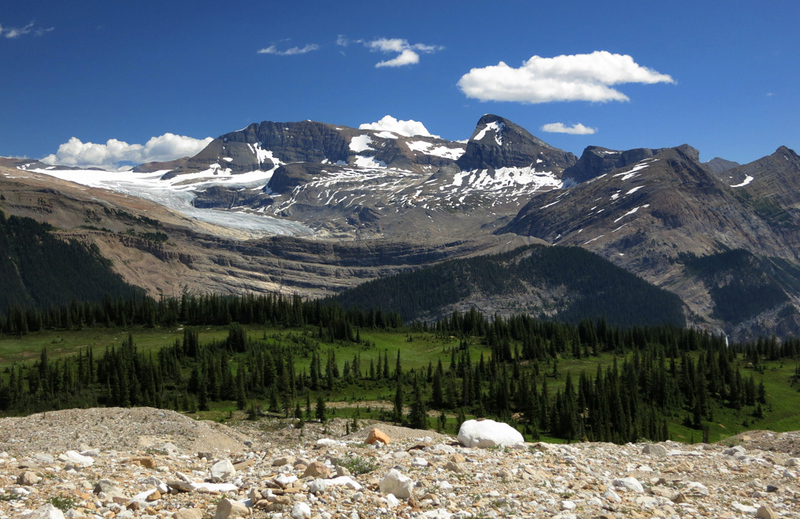 McArthur, the Des Poilus Glacier and Isolated Peak anchor the far end of the Iceline Trail as you near the Little Yoho Valley. Due to its tendency to become a bit of an oven on sunny, summer days, you'll want a healthy supply of water and good sun protection. If you want to save weight, especially for the long, steep climb at the beginning, you should consider bringing a water filter with you. There are numerous water sources along the route where you can replenish your supply with a filter, greatly reducing the amount you would need to carry in with you. 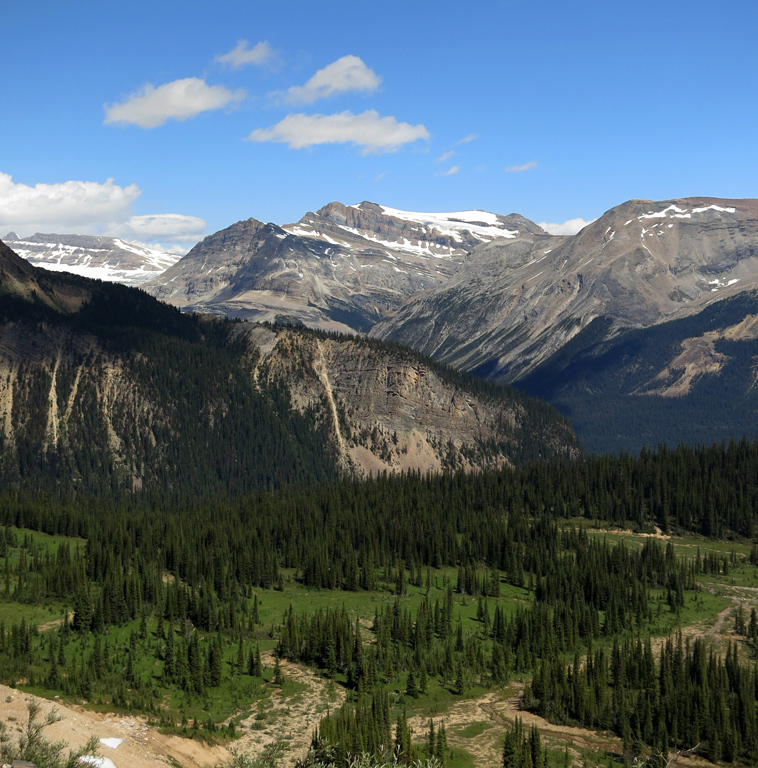 This report comes from a three-day trip, beginning with Little Yoho Valley I and Little Yoho Valley II. Summit: 2,783 m / 9,131ft.